Producer/ General Manager: Kim Vasquez/ Gray Lady Entertainment Inc.
Set in 1955 on the sexually charged campus of Whitney College, this rollicking, romantic comedy, suggested by Shakespeare’s Much Ado About Nothing, finds Coach Benedick (Mark Zimmerman) and English Lit. Professor Beatrice Stanton ( Barbara Walsh) waging their “merry war of wits.” Love, laughter and a little mischief are on a spree in high-flying, heart-warming musical that puts the comedy back in musical comedy. A golden age musical, but a modern sensibility, ABOUT FACE has its supporting cast of young, attractive men and women, all getting themselves in and out of trouble. 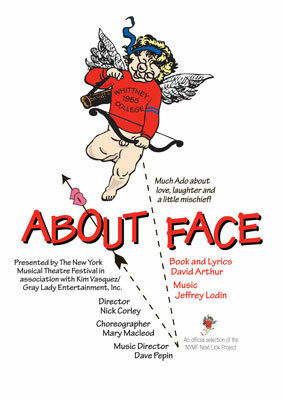 Written by award winning authors David Arthur (book and lyrics) and Jeffrey Lodin (music) About Face was originally developed in the Tony honored Lehman Engel BMI Workshop along side such shows as Next to Normal, Musical of Musicals and Avenue Q. About Face is a winner of the Cardiff International Festival’s Global Search for New Musicals and received special recognition from the Richard Rodgers Foundation.